This article lists bugs which you and I have encountered in macOS Mojave 10.14.3 itself, rather than issues in specific third-party applications and other software. Note: This article refers to 10.14.3 and is no longer being maintained. To see the list of bugs in 10.14.4, which is being maintained, please go to this article. This bug also affects Bookmark-based aliases created by alisma, and is discussed in full detail here. It has been reported to Apple, but remains unfixed. The information given about ‘legacy software’ in System Information is incomplete and misleading. Fuller details are here. Use 32-bitCheck (from Downloads above) instead. macOS seems to be building this list as and when macOS warns the user that each specific 32-bit app needs to be replaced. Those warnings now occur more frequently, but are still far from complete or comprehensive. Until their list is complete, which could be well into 2019, users will find 32-bitCheck far more reliable for informing them which apps and other software are 32-bit. Jeff Johnson, developer of StopTheMadness and Underpass, has discovered a means by which apps with a hardened runtime enabled, in other words any notarized app, can access the protected folder ~/Library/Safari without any restrictions being applied by Mojave’s privacy protection. He has disclosed this to Apple, but has not provided further public information. This is effective in all versions of Mojave, including 10.14.3 with the Supplemental Update installed. This apparently only applies to hardened apps; those which run in a sandbox, as do all supplied from the App Store, cannot exploit this vulnerability. According to Marcel Bresink, if an app asks macOS Mojave for a complete list of group accounts on a system which uses a network directory service, this can hang macOS for a period of seven (yes, 7) minutes. He has had to work around this problem in his TinkerTool app version 6.2. I confess to not having tested this out here, but rely on his account in his release notes. This bug appears to have been present since the release of APFS in High Sierra, and persists in 10.14.3. Using the Resize… command in the Images menu on a disk image in APFS format invariably fails immediately, with an error message. Prior to 10.14.3 (possibly earlier), macOS (possibly WebKit) defined a UTI of com.apple.generic-internet-location which mapped to the default browser. Apps like Firefox which save some URL bookmarks as .inetloc files of this type relied on this, so that opening one of those files opened it in Firefox. Mojave 10.14.3 appears to remove that mapping to the default browser, so that there is no app now which is able to open an .inetloc document. This makes these bookmarks unusable, although it doesn’t appear to break any Apple software. Further details are here. I have now confirmed that, prior to Mojave, .inetloc files were properly supported and worked. They are used here by Firefox in an effort to open bookmarks made by its reader in reader mode; Safari saves all bookmarks as .webloc files, so always opens them again in normal browser mode. Sometimes, the circular progress icon displayed in column and list views during file copying becomes frozen. It then shows early progress at the start of copying, and remains fixed despite those files being successfully and completely copied. Presence of the icon misinforms the user that the copy hasn’t been completed when it has. These erroneous icons persistent indefinitely, until the Finder is restarted. The only way to clear these is to force the Finder to restart. Further details are here. After ejecting a disk image, Disk Utility displays a period of sluggish behaviour, during which spinning beachballs commonly appear for short periods. Another odd effect is for the app to select sequences of eject icons in rotation. The fix for this is to select one of the remaining mounted disks or other items in the left side of the window, which should restore normal function. This tab is almost unusable as a result, making it impossible to set or maintain app shortcuts. The version and build number of TextEdit in 10.14.3 is identical to that in 10.14.2. If you set Safari 12.0.3 to open a local file as its Home page, this may cause an error when Safari first opens, and that error may in turn result in another error reporting that the error page can’t be found. Others also report Safari’s inability to search until a remote page has been loaded, and other potentially related issues. These are detailed here (see the comments there in particular). Although Font Book used to be able to, and its Help book still claims that it can, since 10.14 (including 10.14.3) it has been unable to disable or remove any font stored in /Library/Fonts. It can currently only disable or remove those in ~/Library/Fonts. In Finder column views, the space fixed for display of thumbnails/icons is too high. This makes the user scroll to see the item’s metadata, even when the view is very deep. Further details are here. There is no workaround as far as I know, other than to scroll the view. During the 10.14.3 update, the progress bar was misleading, only reaching just over 80% by the end of the download. There followed a significant period in which the remainder of the bar gradually filled, with no explanation as to what was going on, or estimated time to complete. Following that, the pane returned to offer Download and Install again, which finally started the update process. There is no workaround other than patience, and further details are here. An old bug, possibly going back to 10.5: when an app tries to discover the type of a file or folder by requesting its UTI, certain files, such as sockets ‘virtual files’, return a instead of a UTI. If this response isn’t handled by the calling app correctly, at worst the app may crash. Full details are here. About This Mac – Storage bar now appears to report much more reliable figures, at last, although these may take time to appear. App Store – claims apps need to be ‘redownloaded’ – doesn’t appear to occur now. Keychain Access – pasted text shown as black on dark grey in Dark Mode – largely fixed for new notes at least. Mr. Howard, if I were to search for the issue of being unable to paste into the name blank for new docs, I am missing key words for the search. What is the technical name for the file name blank field on all new documents? I don’t know that it has name – something like ‘document name popup window’? It’s part of AppKit. Does this happen in all your apps, or just some? I just click on the Untitled document title to pop the window up, select the Untitled text before the default extension, and Cmd-V. I don’t understand how that can’t work. Yes, all apps. When I create a new file, new pdf, new Pages doc, new TextEdit doc, I cannot copy and paste into the file name blank. I must manually type the stupid name. I get a system beep when I paste into this blank. New Affinity Photo docs, any docs, cannot paste into the file name, must manually type the name. STOP: Apple+V was assigned to Paste and Match Style. Deleted this command in System Pref/Keyboard. Reassigned Apple+V to “Paste”. Rebooted. Everything fine now, sorry for interruption. Don’t worry about asking such questions. It always helps to discover whether it’s something local, or maybe a wider problem. I’m just delighted for you that you managed to work out what it was. Helps to keep a separate clean account, to test behavior in the main account. Then think through why. Always appreciate your generous comments. ColorSync Utility has never worked properly since 10.2 (yes, 10.2) at least. They re-did the UI for Dark Mode, and made some improvements, but still managed to break some new bits. A variety of Profiles can’t be selected in Filters, and the system-built Quartz Filters don’t show the correct settings in the app. Thank you very much. I must admit that I haven’t used it in anger since Sierra. I’ll take a look over the weekend and see what individual bugs I can tease out and detail. 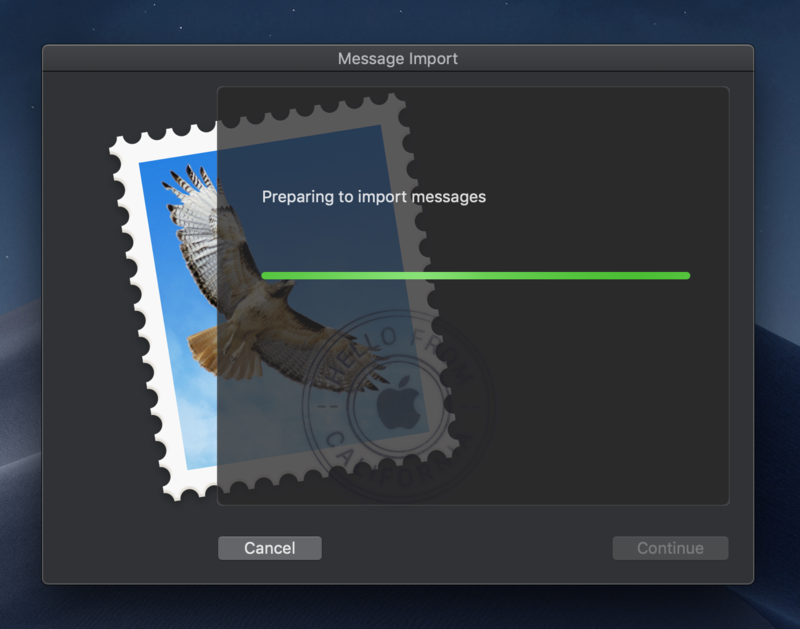 Have you seen the Mail.app Message Import Dialog? Thank you. Could you explain what the bug is, please? Ah right: I see what you mean now, thanks. It looks like the left hand of the dialog doesn’t know what the right hand is doing! I’m not sure if you have mention this bug (?) before but I see that it still exists since the first release of Mojave till 10.13.3. When I open a pfd document in preview in Dark Appearance I’m able to highlight (select) the text almost with every Highlight colour except Graphite. It doesn’t work even if I reopen the Preview.app. Just pick up a Highlight colour from the Highlight colour drop down list (except Grey in Dark Appearance). OK? This time change the Accent colour in Grey. Here we go again. The same problem. Even in Light Appearance happens the same. Sometimes it works some other times not. Just give it a try and you’ll find out what I mean. The problem is not with the highlight colours (Highlight tool) that Preview.app uses but with the colours from System Preferences. Open a PDF and select (highlight) a part of the text with the coursor. Maybe your colour is the blue. OK. Now, go to System Preferences > General and change the Highlight colour to Graphite. Try to select a part of the PDF again. You can’t. Repeat, but this time change the Accent colour (System Preferences). The same result. I have tried to repeat this in Preview in 10.14.3. Here, I only see five colours offered for the Highlight feature, the last being purple. There is no grey/graphite on that list, in Light or Dark Mode. I ran through the feature in both modes, and can’t see anything different in the two – it appears to work correctly, even with the Accent switched to Graphite. Has anyone else run into this problem, please? Sorry, maybe I didn’t explain it very well. Try to change the colours mentioned above in System Preferences > General. Actually, looking at it on your recording and here in Preview, the app has got selection highlighting completely wrong. Correct behaviour is that when you change the Highlight colour in the pane, this is reflected when you switch back to the app’s window. In Preview, the highlight colour for any current selection remains unchanged – you have to make a new selection in order to see the new colour. And yes, the Graphite selection highlight doesn’t show up in Dark Mode, and sometimes not in Light Mode either. It looks like selection highlighting in Preview is pretty thoroughly broken. I will add it to this list when I get a chance, later today. Thank you for your patience and perseverance with me. Was the “Install failures – possible disk format problems” from 10.14.2 fixed in 10.14.3? This is the one with the disk error -69854…really bad bug for me. I’m sorry, I don’t know. I haven’t come across any reports since the 10.14.3 update, but neither do I have a Mac with a Fusion Drive on which I can test this out. So I have removed it from this list for the time being until I see reports. It isn’t in the list of known bugs which have been fixed, though. My battery is draining too fast even while doing simple tasks. Have anyone faced this issue? I’m not aware of any systematic problem. Two useful tools in the first instance are EtreCheck, which can pick up misconfigurations etc., and the Energy tab in Activity Monitor, which will tell you what is using your battery up. I’ll bother you for once more time and I ask for your patience. As it is known there are many ways to move a file or folder to Trash. a) With the keyboard shorcut command(⌘) + backspace(⌫). b) Right click > Move to Trash. c) From the Finder’ s menu Edit > Move to Trash. d) From a Finder’ s window by clicking the Delete (Trash) button if you have placed it into the Toolbar. or, just drag&drop it immediate onto the Trash icon to the Dock. OK. Now, open the Trash, select the file or folder and by clicking the right button on your mouse select Put back from the menu. Everything works just fine. The file or folder returns to its primary place, for example to the Desktop. 1) Lets see what happens when you decide to create a service or an app using Automator. In Automator’s library we find the action, Move Finder Items to Trash. Create just a simple service only to see the result. Choose: Workflow receives current> files or folders in > any application and drag&drop the action. Save it. ΟΚ. Now, choose a file or folder > right click > services > click on the service you create before. The file or folder will move to the Trash. So far so good. Open the Trash > right click on the file or folder and… where is the Put Back in the menu? Nowhere. Why? Too weird. 2) If you use The Unarchiver.app to unzip your zip files, open the Preferences > Extraction > After successfully extracting an archive: (choose) Move the archive to the trash. Now, unzip a file and after that open the Trash. Select the zip file, right click on it and… where is the Put Back in the menu? Once more time… nowhere. It doesn’t exist. By using the Automator’s action Move Finder Items to Trash even the workflow contains only this action or it is more complex the final result is that when you use the service to move files or folders to Trash after you are not able to put it back unless if you do it manually. The problem is exactly the same if you use some 3rd party apps like The Unarchiver, or I don’t know what else. Please, tell me if I am wrong somewhere, but it is not normal. Why I cannot retrieve my files or folders from the Trash? Thank you, Dimitris. It’s hard to know whether to call this a bug or a limitation, but it comes down to how an action is executed and who is responsible for handling its Undo. I’m just starting work on a series of articles on Quick Actions like this, and this is an interesting issue with them, and with other apps which move files/folders around. In the Finder, when you move an item to the Trash, this is handled as a command, for which there is an Undo. When an app or Quick Action does this, it is responsible for providing the Undo, as that isn’t handled by Finder on its behalf. An Automator script runs, then quits on completion, so it isn’t around to handle any Undo. So that is the reason that this is happening, and there isn’t any simple way of providing an Undo action for a script or app which has run and quit. I hope that at least explains why this occurs. It’s crystal clear from your part and thanks for your precious time. If it is a bug we have to wait until Apple will fix it. But, if it is a limitation, it sounds to me (from the Apple’s part this time) like: “Don’t use the Automator to create an app or a service including the action Move Finder Items to Trash or any other app acting like that, cause you’ll have problem to Undo files or folders from the Trash”. I can understand the whole thing but someone else maybe come in front of big troubles. When I use the app BetterZip to unzip zip files I am able to Undo the zip file from the Trash. But, when I use the Unarchiver app I can’t. Both of them have the option to unzip first and send the zip file to the Trash then. I really don’ t know what to say. I’ m confused on that. That is up to the app itself to handle. BetterZip clearly does, but Unarchiver doesn’t. Undo isn’t a feature provided by macOS, but by each app itself. I absolutely agree with you. That is up to the app itself to handle it finally. I cannot come up to any other conclusion and by the results of my personal search and tests with the apps. Thanks for your time and your patience with me. I am not sure if it has been mentioned somewhere before but, today as I opened my Applications folder in a list view I noticed that the Finder’s horizontal scroll bar appears transparent above the apps. In System Preferences > General I’ve chosen, Show scroll bars: Always. But even if I change it to Automatically based on mouse or trackpad it still remains the same. All the above in Dark Mode. In Light Mode everything works fine. Thanks – yes, I can reproduce that here too. However, I’m not sure whether it may be a design choice, or just a design inconsistency. Scroll bars are inherently transparent, although when you fix them to be displayed always, that puts them in their own box which is only transparent for the horizontal scroller in Dark Mode. An interesting point, though, thanks. Testing this issue again today connecting my Magic Trackpad, my Magic Mouse and finally my wired mouse I saw differences. Finder’s Flexible Space from toolbar doesn’t always work properly. The video is from my YouTube channel. Thank you – an excellent demo. I will check this out a bit later, with a view to adding it to the list. Thank you – I will add that when I get a chance. The Graphite accent color is buggy in the UI of the General prefpane as well. If you click back and forth between all the colored circles the dropdowns change properly in the General prefpane window. But if you click back and forth between Graphite and any other colored circle the accent colors on the dropdowns can be become the opposite of what is currently selected when switching back & forth etc. Thank you – I will take a look at that over the weekend. I have MacBook Air early 2015 with Mojave 10.14.3. It has Audacity installed. Can I successfully install latest Sound Flower? I don’t know. Some report success, others intractable failure. All you can do is try it, and see if it works. This isn’t a Mojave bug but a Microsoft bug in OneDrive. If you are getting a Warning in Recovery>Repair which a few of us have had for the past few weeks, I tracked mine down to the OneDrive folder and I believe a hidden file in it, with a db file extension on the end of it or close to the end of it. I moved my files to another folder and then deleted the OneDrive folder and went back to Recovery>Repair and the warning disappeared. I am not reinstalling OneDrive until such time as Microsoft fixes the bug. Thank you for that worrying information. I’m glad that I don’t use OneDrive. but frequently visited sites are not shown. Thank you – I will look at that later today. Thanks, Jeff. I can’t reproduce that here – Show Favourites does indeed show Frequently Visited when that is enabled. However, it only shows them in the Favourites page, not in the Favourites list in the sidebar. I’m not sure whether that is a new behaviour, as I don’t normally use this feature. Are you aware hoakley of unreliability when using Applescript? I implemented scripting definitions in a couple of my apps years ago so that users could control certain things using AS. As far as I’m aware it’s worked fine for years, but now seems to be a bit unpredictable – randomly working or not working, and sometimes giving an error, especially the first time the script is tried after the user logs into the system. This may not be a recent problem, or it may not be a problem with the system itself but my implementation. It would just be useful to know whether you’re aware of any problems along these lines. There have been many issues reported in AppleScript and its support, some of which are clear bugs. Have you tried rebuilding your apps using current tools like Xcode 10.1? This sometimes can help alert you to issues, but of course it can also introduce new issues and bugs too! Another bug is suggestd—to be precise: com.apple.suggestd.event-metrics-queue—continuously crashing every 20 minutes or so with an uncaught exception (NSInternalInconsistencyException) and invalid serialization warning. If you untick “Show contacts Siri found in apps” in the Contacts app under Preferences > General, the crashes stop. It seems that Siri keeps a list (database) somewhere of all the contacts it has found in other apps, and it might be a database corruption that’s behind it, according to speculation by a user on another website. Thank you. I’ve searched my log for entries from that sub-system, and it appears completely silent here. Could this perhaps be a little like mdworker which can still choke on certain files and keep crashing and restarting? Why I cannot resize any sparce disk image created on Disk Utility.app with APFS format? I always receive the message “The selected disk image cannot be resized. Resourse temporarily unavailable”. I’ve tried with Terminal and the command “hdiutil resize -size….” but nothing “hdiutil: resize: failed. Resource temporarily unavailable (35)”. I’ve tried the same with HFS+ format and I had no problem. I haven’t tried this myself, but there’s a complex sequence detailed here which should work. Please let us know whether it does. I will look at what is going wrong here, but am currently in the midst of writing my section for MacFormat, so it may be a couple of days before I get to work on it. I can only increase the size of the disk but it is impossible to shrink it. I’m sending you two more interesting things about Disk Utility which I found yesterday. It has to do about the eject buttons. One photo and one video recording. Just take a look. It is so funny. Thank you. I will take a detailed look when I get a chance. I’m in front of very strange behaviour as much as concerns mount and unmount the disk images with disk utility, too. Everything looks to work just fine but after a couple of minutes the DU acts like crazy. Here’s my new video recording. I apologize for my insistence but I’m trying to understand what is going wrong. And it seems there’s no end. I think we need to be a bit careful here. Disk Utility has had many quite serious bugs in the past. In Sierra it was usable but had some terrible habits and faults. Then in High Sierra, with the addition of APFS support, it was so flawed as to be a major security risk (remember the disclosure of passwords in hints? ), and had many serious bugs. My experience of the version in Mojave is that it is much improved from High Sierra, thankfully. Some of the odd events that you are seeing are really the result of inadequate ‘stress’ testing, and although potentially confusing, they don’t limit its functionality in any practical way. Over the next few days – once I have finished my article due for publication – I will take a more thorough look at some of these issues, and try to identify significant bugs which need to go up in this list, so that other users can beware. What exactly I did was the following. I just created 3 different disk images because I wanted to test the resize command with Disk Utility and Terminal. There was only one of the three disk images mounted and when I decide to mount the second one, it started act like what the video recording shows. After that I tried to reproduce the above issue, so I came up to that result again. I closed the Disk Utility doing something else. Some time later I opened it again and I created a new one disk image. When the creation finished it didn’t show up on the list. So, I opened it again. Nothing. To check what is really going on I opened the Terminal and the diskutil list showed it up. Maybe all the above be useful for a further more investigation. I have run into a Disk Utility issue. The first column can’t be resized !. Thank you – I will take a look when I get a chance. How are .textClipping managed in Mojave? I have a ton of them on a Mountain Lion drive that I cannot access without booting it directly. It’s a strange filetype that you may create when you hold and drag text on the desktop, I use it everyday because it’s faster than opening a new text file and saving it, but it is a mess for backups or system migrations. You can put them on a usb drive but only macs will read them. I do not known how they are made, but I suspect they are metadata written on folders or drive index. That’s a good question, thank you: I’ll take a look and report back when I can answer your question. There will be a whole article about Clippings tomorrow (Tuesday) morning at 0730 UTC. Unfortunately I do not live in 4019 but in 2019. Which model of Mac is that? Executing the NVRAM reset for the third time, now the date looks normal. You don’t need to reset the NVRAM just because of that. As far as I know, that is only stored there as a reference, and will be overwritten the next time that you run diagnostics. If it’s in error like that, it won’t affect anything else, I don’t think, just look odd. There is a big problem here. I’m checking it out right now and I’ll send you in a while the whole story. Here’s my story with Apple Hardware Test. I’ve tried to run AHT some days ago but I couldn’t enter it pressing the D button. The result was white screen. So, I tried with Option-D. I ran the Reinstall macOS. After that I was able to enter the AHT pressing the D button. Today I took a look into the System Information > Hardware > Diagnostics. I saw the date 4019! Cause I am so curious guy, I restarted my Mac to enter the AHT pressing the D button. For once more time, nothing. The result was white screen, again. I’ve tried, pressing the Option-D combination and I entered the AHT. I did ran the test and I restarted my Mac. Checking again into the System Information > Hardware > Diagnostics I saw the following result again! The model of my Mac is the iMac13.2. First, are you wiring your keyboard to your Mac before trying to start it up in Diagnostics? Some models don’t boot Bluetooth up early enough for it to be reliable in detecting the keys to enter startup modes, so it’s best always you wire keyboard and mouse/trackpad up before trying to use them. I don’t think this is a significant issue. As far as I know, this info is merely stored in NVRAM for reference, and an incorrect year or date there doesn’t affect anything else. It looks like a minor bug either in diagnostics or System Information. Yes, I have an Apple Aluminum Keyboard with Numeric Keypad. The major problem is the ΑΗΤ which I cannot run it and I have to start it up over the Internet. As for the date, I don’t know, maybe it is a minor bug. I’m not worried about something, only I’m trying to understand why is that happening. OK. This is surprisingly complicated, but basically it’s because your internal drive has lost its diagnostics feature. Unfortunately it’s usually incredibly difficult to restore, because of SIP. The other possibility is that you have set a hardware password: if you have, you need to disable the password first, then start up in diagnostics mode. This also probably explains the date problem, in that the online diagnostics are probably supplying the date in the wrong format, for some reason. I will write a bit more about this for Tuesday morning. I do not use firmware password, cause I’m the only user. As I mentioned above, I can enter over the Internet pressing the Option-D combination. If the firmware password is active this action it isn’t possible, too. Thanks – yes, that is the only other factor which can stop regular diagnostics mode from being available, so I thought it worth checking. This means that your Mac doesn’t have the diagnostics mode code available. I will explain more tomorrow, but it isn’t an easy problem to solve, I’m afraid. Is it possible to change the permissions to a folder which is in an external hard disk, from the Guest’s user account without the Admin password? I mean without unlocking the padlock even. For example, we have a folder with Read only permissions and we want to change it to Read & Write because we want to add some stuff in it. Is there any possibility to do that? In any way. Or the Admin password is necessary? I apologize for my off topic and maybe silly question. Yes of course you can – and questions are never silly, although answers can be! If this is on an external drive, your best chance of being able to do this is to connect it to another Mac with an admin user logged into that. There’s a box at the very bottom of the Finder’s Get Info dialog to ‘ignore ownership on this volume’. When that’s checked, it should be easy, but you should still be able to change the permissions on that folder, with a bit of luck. Ok. When you have time, please take a look at the following two videos and tell me what is wrong or if I am wrong? Because it seems to me that I can change the permissions in an easier way without touching the padlock not only from an Admin account but even from the Guest User account and without the Admin password. Yes, because you are already logged on as that user, just like you can lock and unlock files which you own. That’s what permissions should allow. I’d be really impressed if you could log on as the Guest user and change permissions on an item on your internal disk which is owned by the Admin user (with other users having no or read-only access) without having to authenticate as the Admin user via the padlock. Now that would be a serious bug! One of the basic effect I noticed just after moving from High Sierra to Mojave is an overall slowness of my Mac (2017, 21.5 Inch, 3.4Ghz core, Fusion drive) that seems associated to a disk activity. Despite all my investigations (sudo fs_usage -f filesys; activity monitor etc.) I was not able to understand if the slowness is due to a much higher disk activity, related to the Mojave OS, or to a much higher disk slowness, caused by Mojave for some other reason. It is confirmed that the slowness is related to disk: I can hear disk access noise, I can check that basically CPU is inactive, but I can see in the activity monitor that only the disk access is high. It doesn’t seem to me there is a specific process causing this, it is a mix of kernel_task, processes related to spotlight (as mds_store) or to iCloud etc. But basically, as soon as the Mac startup is completed, there are some minutes where the disk access becomes high and the computer slow. Then it tends to stabilize. It is like if Mojave concentrates a lot of disk-related processes to happen just after the startup, thus causing a serious penalty in performances (or at least you need to wait some time before all this disk access ends). As said above, I’m not sure this is just an increased disk activity. I have the perception that it is the overall disk access which has become slower (like if for each disk access the Mojave adds some other penalties) so that even other programs using the disk seem to be penalized. All these penalties were not present in High-Sierra. And I soon noticed just after the OS switch. Of course, my disk is empty and my CPU is fast. I don’t have any penalty in cpu activity. In summary: high disk activity for about one or two minutes after the startup. More generally seems also disk access is always much slower.